Arizona’s hot, dry desert landscape is a challenging climate for growing roses. At temperatures above 90 degrees Fahrenheit, rose plants use food faster than its foliage can produce it from sunlight, water and nutrients. Certain types of roses can survive and even thrive in the harsh Arizona weather. Selecting the proper type of roses to grow in the extreme heat is an important step toward having a successful garden. Roses grown in Arizona need loamy, sandy soil that drains well. The dry, hot climate evaporates moisture quickly, making watering of roses critical. Remove soil in the planting area to a depth of 18 inches. Replace it with a mixture of loam, sand and organic matter. After planting the roses, add a thick layer, 4 to 6 inches, of shredded bark mulch to retain moisture. Do not overprune roses in Arizona's hot climate. Less pruning allows roses to grow more foliage so the plants can store energy and water for the summer. 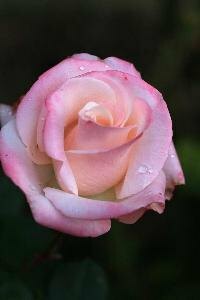 If necessary, prune roses in the cooler winter months such as December or January but only to shape the plants. A hardy rose, the Fourth of July survives well in heat and can grow in cooler climates until the first frost. It has a fruity fragrance with a hint of citrus unlike the traditional rose scent. A fast-growing climbing rose bush, it reaches 6 to 8 feet when mature. An excellent repeating rose, the red, white-striped ruffled flowers, about 3 inches wide, bloom throughout the year. The bright green foliage is disease resistant to rust, black spots and mildew. Pruning it in January helps promote new growth during the summer. The Fourth of July rose is ideally suited to grow on an arch, trellis or pergola. With soft pink and white petals that resemble apple blossoms, the Ballerina rose is an ideal shrub to cover small to large areas. Tolerant of heat, it is a good repeater in the summer with a second blooming before cooler weather. A small shrub that grows 4 to 5 feet, it requires little maintenance. In the fall, its pale rose hips change to a bright red-orange color. The blooms normally reach less than 2 inches wide. Prune the shrub to any shape, size or allow it to spill over the landscape naturally. With an almost perfect form for each rose, the Gemini Hybrid is a favorite as a cutting rose and in flower shows. A large flower with 15 to 20 cream and pink colored petals, a bloom reaches 5 to 7 inches wide. The pink color deepens as the plant ages and the dark green foliage has a glossy appearance. A Gemini Hybrid rose plant can grow up to 5 feet tall. It is an outstanding repeater with a light, sweet fragrance that makes it a good choice for bouquets. Known as the Rose of the South, the Rosa Blush Noisette is one of America’s oldest roses. It thrives in warm to hot climates. An eye-catching bush, the plant produces clusters of red-purple buds that bloom into a white or pink flower with a yellow center and a spicy rose scent. The Rosa Blush also has few thorns. Reaching up to 6 feet tall and 5 feet wide, the bush is a great climber on walls, arches and trellises. With a bloom size about 3 inches wide, it looks appealing in any size garden.